With just 1.5 games separating the final playoff spot, the Wizards needed another strong victory, tonight they just couldn’t find a way to continue to top the 15 point victory over the Hawks at Phillips Arena just two nights ago. 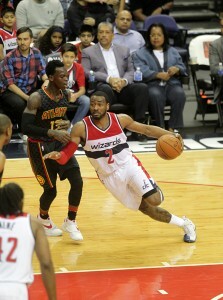 John Wall tries to get past the Atlanta Defense in the fourth quarter. Behind 23 points from reserve guard Dennis Schroder and a season-high 17 3-pointers, Atlanta did just that in beating Wizards 122-101 on Wednesday night in the second half of the teams’ home-and-home series. The Hawks were all too happy to snap the Wizards’ winning streak at five after the way Monday’s game went. With the loss tonight for the Wizards along with the Detroit Pistons’ fourth consecutive victory, Washington fell 2 1/2 games back of the eighth and final playoff spot in the East with 11 games to go. Turnovers were the Wizards’ undoing as they committed 13 in the second half. Marcus Thornton led the Wizards with 23 points, including five 3s. But it was no match for Atlanta’s barrage from the outside. Washington will need a super solid showing on Friday night against the Timberwolves or the next 9 games after that one may not mean much of anything for the Wizards.